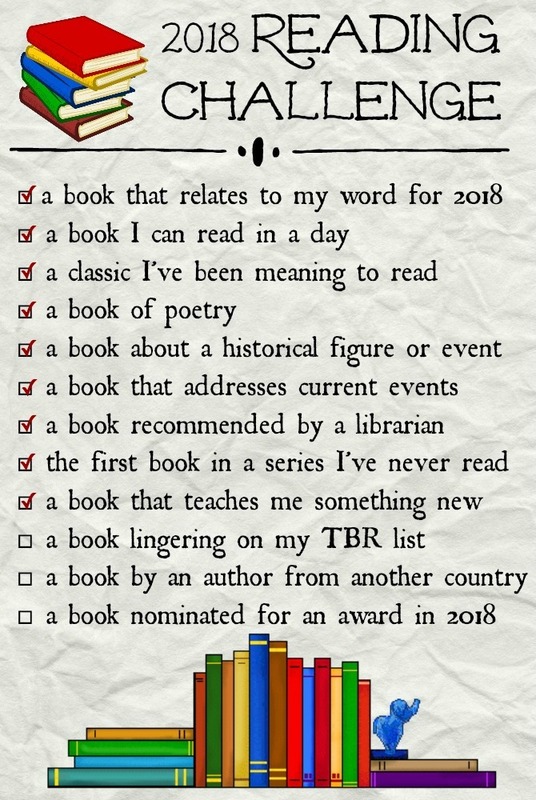 2018 Reading Challenge: A book that teaches me something new. There are many, many reasons why reading is my favorite pastime, but one of the most treasured aspects of my reading life is that books are always teaching me something new. I believe that every book offers learning opportunities: novels teach us about the lifestyles and motivations of other people, give us new perspectives to ponder, and expose us to different places and times. From nonfiction books we can learn about anything under the sun, from history to science to how to discipline our children. Even a book that I strongly dislike has something to teach me, even if the only lesson is that that book wasn’t for me. Because I view every book as a chance to further my own education, this month’s Reading Challenge prompt—a book that teaches me something new—offered limitless options. 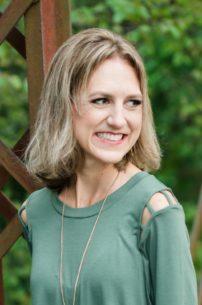 Rather than allowing myself to grow overwhelmed by my choices, I took a fairly straightforward approach to picking this month’s Challenge book: I walked down the nonfiction aisles of my library and grabbed the first book that stood out to me. 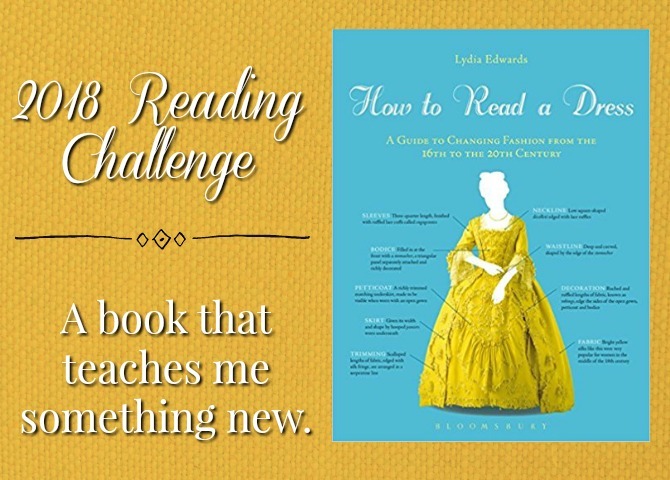 My only stipulation was that it be on a topic I hadn’t read about before, and How to Read a Dress: A Guide to Changing Fashion from the 16th to the 20th Century easily qualified. History and fashion are both subjects that interest me, but I haven’t spent much time reading about either one, and I most definitely had not read a book combining the two topics. There was a lot to learn! How to Read a Dress is an annotated visual guide to women’s fashion from the 16th through the 20th century. The book is divided into eleven chapters, with each chapter exploring fashion during a particular time period. Each section is prefaced with an overview of styles during the period, as well as information about significant designers or historical events that led to certain style evolutions. 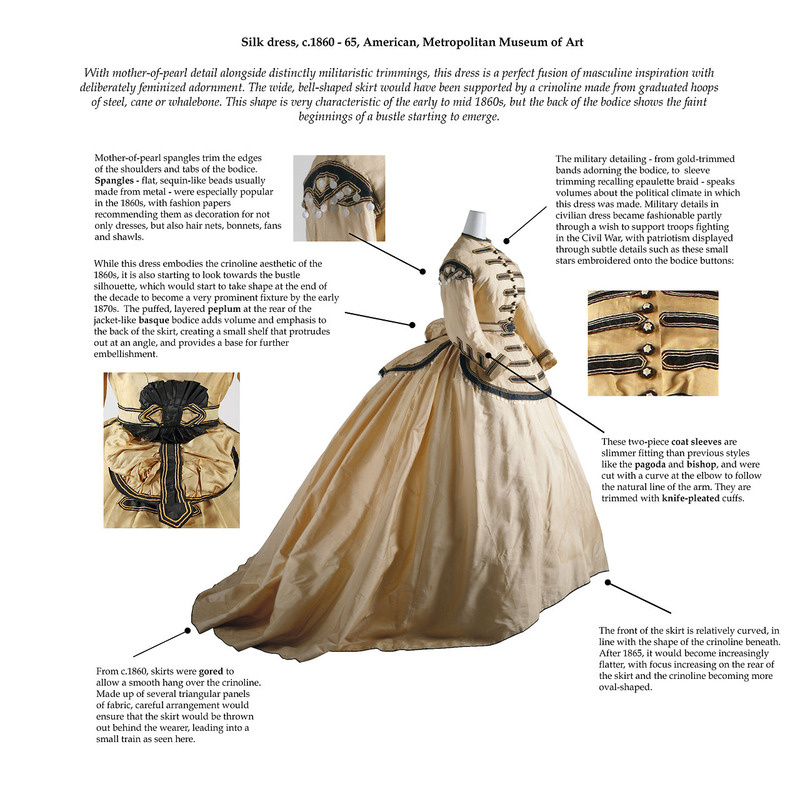 Each brief introduction is followed by several images of dresses from the period, accompanied by notes about the cut, fabric, and undergarment details, as well as information about the wearer, occasion, and relative popularity of the style. The photographed dresses are beautiful and, having spent time reading about and admiring them, I know I will have a better mental image of the types of dresses worn by the heroines of historical fiction that I read in the future. The detailed annotations accompanying the pictures are quite technical, with many terms that were foreign to me (the glossary at the end of the book helped with this). While this level of examination would be especially beneficial to someone studying historical fashion for a specific purpose (such as costume design), the details were beyond the scope of what I needed or even wanted to know as someone with a casual interest in the topic, so I’ll admit to skimming quite a few of the notes. While I didn’t come away from this book with a perfected skill for “time stamping” any dress that I see, I did have a number of bigger picture takeaways about the history of fashion. Here are just a few things this book taught me. 1. We don’t have a lot of information about styles prior to the last few centuries. There are no photographs of clothing from several hundred years ago, and few samples of clothing from those periods have been preserved, so a lot of our ideas about clothes from the seventeenth century or earlier are based on speculation. Also, because dresses would be altered and remade over many years, it can be challenging to identify a dress’s original design. 2. Historical events drove many fashion evolutions, and new fashions in turn shaped history. For instance, rationing during the World Wars led to a shortening of skirts and dresses because fabric was a precious commodity. The shorter styles allowed women to move more freely and participate in jobs and activities previously held by men, and this played a factor in subsequent feminist movements. 3. Technology has been a huge driver in significant fashion changes. Before dresses could be made in a factory, they had to be sewn by hand; there was very little standardization. The introduction of sewing patterns was another advancement that led to the adoption of more universal styles. 4. Fashion influencers have always existed, but they have not remained consistent. At one time, royalty dictated what styles were popular. As time progressed, print media and later film determined the most popular styles. 5. Fashion has always been broad and nuanced. Today, there are a range of styles that can be considered fashionable. There’s “high fashion” (what we see on runaways, but that nobody wears), everyday wear, formal wear, etc. And this has historically been true: at most points in history, there have been several styles that have been en vogue simultaneously. 6. Historically, fashion moved much more slowly than it does today. In the past, a particular style could be fashionable for decades or even centuries; so different from today, when styles change with every season. 7. History (including historic fashions) repeats itself. The images in this book gave me a clearer understanding of how styles go in and out of fashion; whether it was big sleeves, fitted waistlines, or a floral fabric pattern, a number of styles disappeared only to reemerge centuries later. I enjoyed spotting the historic beginnings of styles that remain popular today, and contemplating which historic styles may be revived by the fashion industry in the future. 8. Fashion is truly an art form. 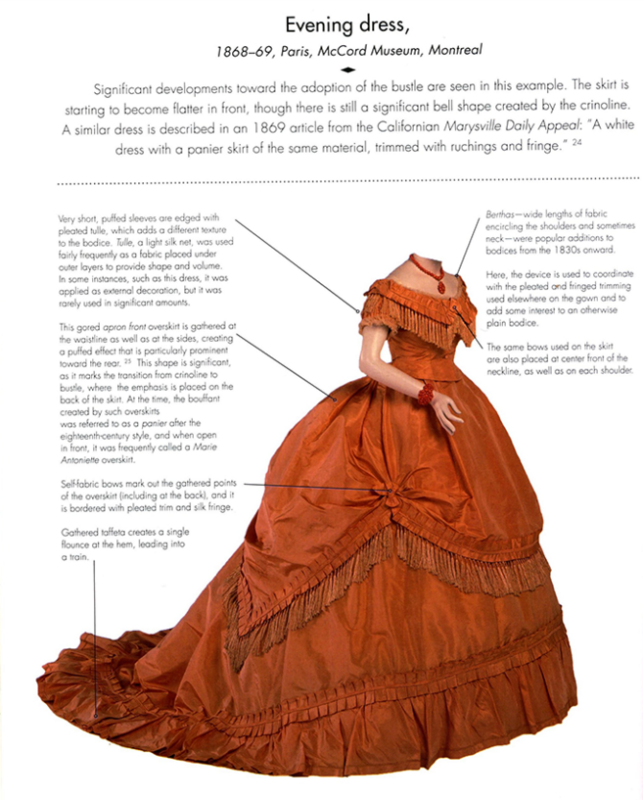 The intricacies of the dresses in this book are astounding. I don’t know that I’ve ever appreciated how much artistry goes into designing and creating a single item of clothing. Despite the seemingly frivolous subject matter, this was a very informative and also quite enjoyable read. I’m glad I branched out a bit in my reading to learn more about this surprisingly broad topic, and I would be interested in reading more. In particular, I’d like to read about how fashion has evolved in more recent decades, and about fashion in non-Westernized societies. Perhaps my biggest “learning moment” in this book is that fashion is a fascinating topic deserving of my attention and study! Each of these books addresses a subject I’d love to learn more about. Next to each title I’ve included a short extract from the Amazon book description. If you’ve read any of these titles and have thoughts to share, I’d love to hear them! 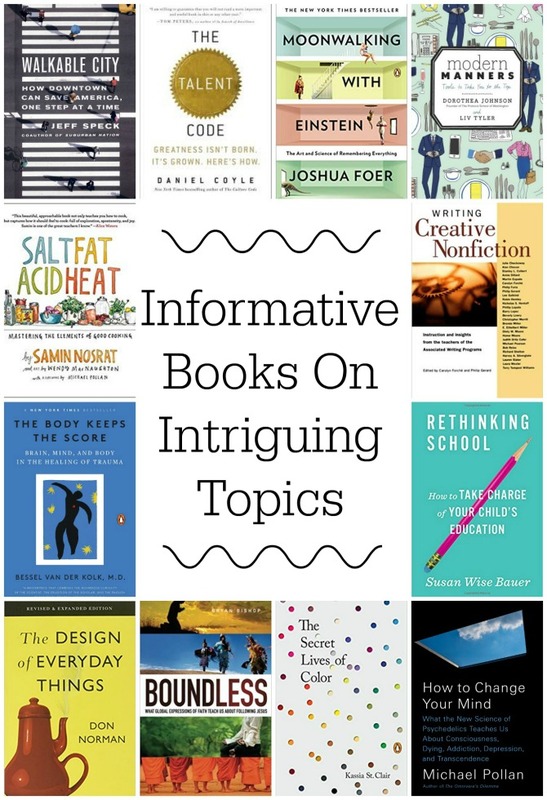 Is there a topic you’ve been wanting to explore further through books? Or a topic that never intrigued you until you stumbled upon a book about it? What would you have chosen to read for this category?